Rose Bertin, dressmaker to Queen Marie Antoinette, is one of the most famous couturiers in history. Born in a small village in a family of small means, the ambitious Rose soon decided to go to Paris to try her luck. She became apprenticed to a milliner, Mademoiselle Pagelle, and later, became her partner. Talented, determined and with a sharp business sense, Rose soon attracted important clients, such as Princesse de Conti, the Duchesse de Chartres and the Princesse de Lamballe, and, through them, met Marie Antoinette. In 1770, she opened her own shop, Le Grand Mogol, who was frequented by the richest and noblest ladies at the court of Versailles. Rose Bertin's business was almost ruined by the outbreak of the French Revolution. Suddenly, even the smallest luxury was considered a crime against the state. Women started dressing very simply and only went to clothing shops for small and inexpensive orders of ribbons and alterations. Most of Bertin's colleagues had to close their shops, but she managed to keep her business going by moving it to London. Even more amazingly, she managed to keep her head on her shoulders despite being so closely connected with the much maligned Queen and being declared an emigree. Rose may have been proud and stubborn, but she also was resourceful and with a strong sense of survival, which managed to see her through the many difficulties she encountered in her life. Unfortunately, there's not much information about Rose Bertin, so this biography will tell you her story, but not in a very detailed way. However, this book is only partly about Rose's life. Half of the book is dedicated to the French fashions of the ancient regime, many of which Rose created herself and helped make them popular. If you're into fashion history, then you have to read this book. It focuses mainly on hairstyles, but other fashions are mentioned too and there are even several pictures to illustrate hairdos and trends. It's incredible at what quick rate one fashion followed the other, and how women didn't hesitate to wear ridiculous and uncomfortable trends just to be fashionable. However, the book is not without faults. The first is the writing style, which, due to the period in which it was written (1906), is old-fashioned and convoluted, which can be quite boring for us modern readers. The second is the author's habit of often citing anecdotes from the memoir of Leonard Antier, Marie Antoinette's hairdresser, always stressing how unreliable a source it is. I'm not sure what the point is in sharing things the author clearly believes to be false. I've found this quite annoying, but overall, this book is a very enjoyable read that all lovers of Marie Antoinette and/or fashion should read. 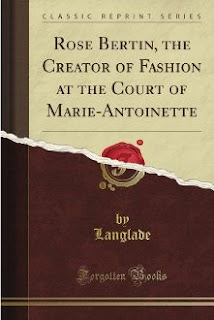 Rose Bertin, The Creator Of Fashion At The Court Of Marie Antoinette by Emile Langlade is part biography and part fashion history. The author discusses, not in very much detail which is probably due to a lack of primary sources, the life and career of Queen Marie Antoinette's dressmaker, and how her designs and creativity shaped the fashions of the ancient regime. However, the writing style is old-fashioned and the author quotes too much from a memoir he believes to be unreliable. Overall, though, this is a very enjoyable read that I recommend to all lovers of Marie Antoinette and/or fashion history.